If you are thinking about choosing Desk.com as a help desk software solution for your company then this article is for you. Our B2B experts prepared a thorough review of Desk.com pros and cons and analyzed what it has to offer to help you make an informed decision before you spend your money. To give you a better sense of perspective on the quality of Desk.com we also compared it with Freshdesk, one of the leaders in the help desk software category. For a more hands-on comparison you may want to get Freshdesk free trial, too. If you need a wider perspective you may also be interested in reading our comparison of top help desk software in 2019. After a thorough analysis of Desk.com functionalities, customer support, and integration capabilities, our B2B experts gave it a high which places it in our ranking of best help desk software solutions. If you need a more comprehensive look at Desk.com features, pricing and integrations you may also read our detailed review of Desk.com or simply have a look at our discussion of its pros and cons below which should also give you a good idea of the software’s capabilities. Our B2B review team analyzed all popular help desk solutions on the market and in our study Freshdesk emerged as the unquestionable leader in its category. It is at the top of our list of best help desk solutions in 2019. Freshdesk offers a wide range of pricing plans to accommodate the needs of all types of businesses. There is even a free plan for small teams of up to 3 agents that allows small companies to enjoy the tool at no cost whatsoever. You can easily try out Freshdesk on your own with their great free trial and see for yourself how it works for your company. Users can sign up for Freshdesk free trial here. If you’d like to get more information about Freshdesk’s features, pricing and customer support you may want to read our detailed review of Freshdesk. A glance at review websites shows that both products have mostly received positive feedback and reviews from customers. The majority of Freshdesk customers say they are very satisfied with the product and give it a good rating. They think that the product features and functions are easy to understand and use, and customer support is reliable. Other customers have said that Freshdesk delivers what it promises and they have found what they need. Desk.com customers have said that they are now able to do more with less effort. Thus, in this category, both products are on an even keel. Freshdesk uses a secured website that is protected with SSL technology to ensure customer information is safe and secure. Tests of the website reveal that there is no phishing activity or viral threats on it. Thus, you are assured of safe and secure transactions when you subscribe to Freshdesk plans on the website. Desk.com uses the https secure connection to ensure safe customer transactions during checkout and payment. Tests reveal that the website does not have infectious content on its pages. Thus, Desk.com is also a safe website where you can make purchases without worries. Desk.com offers only a 14-day free trial, while Freshdesk offers a 30-day free trial. The Freshdesk free trial offers access to the Estate plan for 30 days. After the free trial period, you can select a plan and pay by credit card to continue using the application. There is also a free plan for small teams of up to 3 agents that allows you to use Freshdesk at no cost whatsoever. In that regard Freshdesk is definitely better than Desk.com. You can easily sign up for Freshdesk free trial here. Desk.com offers three plans with the cheapest being the Start plan that costs $3 per month for up to three users with basic functions. The Standard plan costs $30 per user/month (annual payment) or $35 monthly. The Plus plan costs $50 per user/month (annual payment) or $65 monthly. Freshdesk offers five plans with the cheapest being the Sprout plan which is offered free for up to three agents. 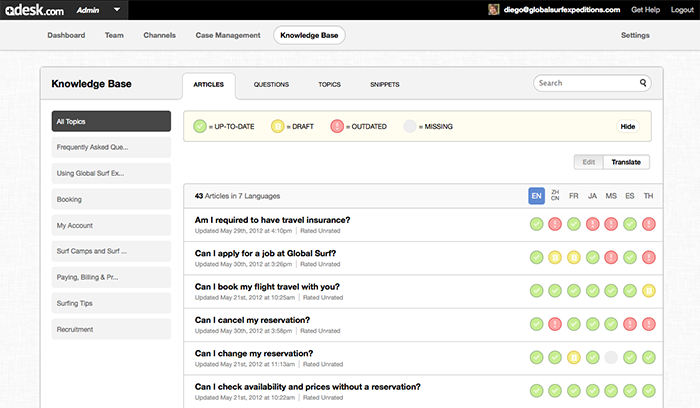 Top features of the Sprout plan include email support, phone support, and knowledge base. The most expensive is the Forest plan which costs $70 per agent billed annually. Top features of the Forest plan include security features such as IP whitelisting and custom email servers. Freshdesk offers a wider range of plans to suit all types of businesses. It provides comprehensive features and benefits which ensure customers get full value for their investment. Both products accept major credit cards such as Visa, MasterCard, and American Express. Freshdesk does not accept other payment methods like PayPal, e-checks, and money orders. It accepts online payments but not phone orders. Desk.com offers customers the choice of paying by invoice if they wish to prepay for 12 months. Freshdesk charges customers on a monthly basis according to the package they have selected. To use the service, customers pay in advance for every month. If you cancel the account plan you can easily get back your money. Desk.com offers a ‘pay as you go’ policy which means you need to pay only for what you use. It bills customers on a monthly basis, and if they do not need the service they can cancel it and will not be billed again. Prominent customers of Desk.com include Diamond Candles, Greenvelope, Roomorama, Yelp, Snap Engage, and Dwolla. Freshdesk is used by more than 50,000 customers including prominent names like Honda, 3M, Hugo Boss, Petronas, Sony Pictures, University of Pennsylvania, and UNICEF. Both products are suitable for freelancers, small and medium businesses, as well as large enterprises. Freshdesk has received good coverage in the media and a high level of popularity on social media sites such as Facebook, Twitter, Linkedin, YouTube, Google Plus, and Quora. It is obvious that both companies make expert use of social media channels to interact with their customers and promote their respective products. A detailed comparison of Desk.com pros and cons and Freshdesk reveals that while Desk.com is a solid and reliable help desk software, Freshdesk simply offers better features and more benefits at more flexible prices. This software is definitely a better choice if you’re looking for an effective solution that will meet all the requirements of your company. You can also easily try out Freshdesk on your own with a free trial plan that will let you test all the key features before you decide if you want to go for a paid plan. You can get Fresdesk free trial here. Teamsupport Pros and Cons: Is There A Better Help Desk Alternative?